Speed matters. The faster you can deploy, deliver, and integrate reliable production releases, the greater your advantage over the competition. Still, there is a certain apprehension when applying these “continuous” principles to the database. Data stored in the database is not simple to restore or reinstall if incorrectly tinkered with. On top of that, database changes are difficult to test. Taking these issues into consideration, it is logical for many to avoid applying continuous delivery principles to the database. On the surface, manual review seems like the safe route to take. Not only is it possible for the database to be part of the continuous delivery pipeline, it’s necessary. To apply it correctly and avoid an error-prone, partly automated, partly manual process, ensure the database planning and management follows practices such as enforced database version control. The idea is the same as traditional code version control, but designed to make sure you achieve a reliable source of truth and reliable foundations, while not having to deal with out-of-process changes, undocumented database updates etc. Then, efficiently package all changes sets that need to be deployed for both application and database. Continuous delivery database changes can be deployed either based on labels or on specific change sets. Perform a trustworthy impact analysis for database changes prior to actual continuous database deployments. The analysis must identify and prevent code overrides or conflicts and make sure we don’t break production by automatically deploying something it shouldn’t have. 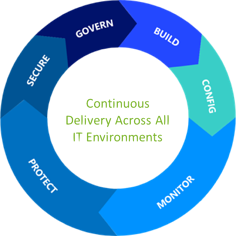 We know that the goal of continuous delivery is to establish an optimized end-to-end process, enhance the development to production cycles, lower the risk of release problems, and provide a quicker time to market. However, more often than not, the database gets left behind. According to a DBmaestro survey, only 13% of companies that practice continuous delivery for their application also apply continuous delivery principles to their databases. The rest are still using manual processes, making it impossible to maximize efficiency. DBmaestro’s Database DevOps Platform enables automated database updates as part of the Continuous Delivery pipeline while giving teams and organizations the kind of control, insight and traceability that they require.